Benchmade is hallowed company among knife enthusiasts. Their name is a byword for quality, and their designs are wildly popular with professionals in every arena. Among the product line of such an established company are a few models that have reached an almost legendary status due to their design, quality, and general badassery. The Benchmade 940 Osborne design has fallen into that category for some time, and recently Benchmade decided to kick it up a notch with their release of the Benchmade 940-1. Is the reputation well deserved, or is this a case of knife industry hype gone crazy? I’ve now owned and carried this knife for the better part of a year and I’m ready to share my views with you. A fairly recent surge in innovation has brought many new blade shapes to the fore in the knife game. By far one of the most popular, and useful, of the new breed of blade shapes is the reverse tanto. Sporting a keen yet beefy tip allows this blade shape to excel at piercing cuts, and the long cutting edge gives it excellent slicing ability as well. The Benchmade 940-1 sports a top of the line reverse tanto blade, forged from Crucible’s top of the line steel: S90V in all it’s powered metallurgy glory. Without getting too far into the specifics of the chemistry, S90V is a highly hardenable, ultra tough stainless steel with above average corrosion resistance – but really this steel is all about wear resistance. Crucible’s micro-carbide processed steels display a super fine grain structure with excellent element distribution, which means no brittle spots. The large vanadium carbides (think super hard steel chunks along the blade edge) will ensure the blade holds a keen working edge for a long time for the average user, while resisting edge rolls and rust spots regardless of the climate you’re in. Bear in mind though that sharpening won’t be a walk in the park through so you’ll need patience, and if you want to keep that micro razor edge you should touch up regularly. Look, you guys know I’m a steel nut…and let me tell you that S90V is something I drool over unashamedly. Benchmade hardens the 3.40 inches of S90V to a Rockwell hardness of 59-61, which is just slightly higher than the S30V of the base model 940. The blade is finished in Benchmade’s classic darkened stonewash, which does a fair job of hiding use. The factory edge is sharp, yet a bit obtuse for my tastes, and is a bit thick behind the edge due to the flat grind which starts only about halfway down the blade stock. 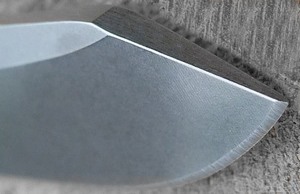 There is a prominent top swedge beginning at about halfway from the base of the blade which thins towards the tip. With a blade stock thickness of 0.12″, there is plenty of steel to tackle tough jobs without worrying about blade flex, while a slender 3/4″ width means it doesn’t get caught up slicing through a tomato, or take up a ton of real estate. There sure is a lot going on with this blade but it’s done with style and purpose. No blade is perfect, but the Benchamde 940-1 proves that you can come damn close. Arguably it’s most striking feature, the handle of the 940-1 is a beautiful combination of organic, flowing lines, and beautiful materials. Benchmade needs to be commended for choice of materials when it comes to the 940-1, because they managed to find the most gorgeous basket-weave carbon fiber that I’ve ever seen. The carbon fiber is entirely free of voids and defects, and shimmers even in low light. There is a flowing line towards the top that creates a mock bolster area, and contouring on both sides offers comfort and style. 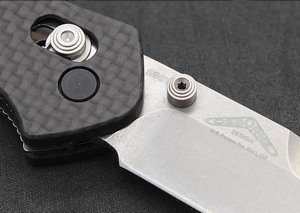 Three small black screws hold the nested liners securely to the carbon fiber scales, and a slightly larger screw makes up the pivot along with a flat black female side. For a knife of this length, nearly 8 inches overall (7.87″) with about a 4.5″ handle, it is amazingly slim and slender: just 0.41″ thick and about 1″ wide at its largest. When it comes to a knife that skinny, ergonomics and comfort can be a concern. The 940-1 addresses this with a gentle forward choil and matching nested gimping on the front and back, giving traction to your thumb and pointer finger in the saber grip. The handle is equally comfortable in just about any grip, and the pocket clip disappears into the meat of your palm without any discomfort. The proportions on this knife are the most naturally balanced I’ve seen in a long while. 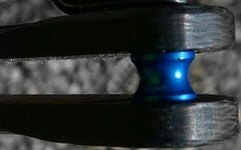 In fact, for such a light knife the balance is incrdible. Although I ended up installing the Benchmade silver deep carry clip on my 940-1, the knife is equally attractive and serviceable with the stock clip as well. A huge part of Benchmade’s claim to fame and popularity is the Axis lock, which is in use on the 940-1, thankfully. Without getting in to the specifics of how the Axis lock works, it allows the 940-1 to be perfectly easy to use in both the right or left hand. Deployment is achieved by using the thumb studs, and this blade flicks out *fast*! For traction during deployment, the thumb studs are a tiered design, which creates ridges that allow your thumb to dig in. One small nitpick in this department would be a lack of easy access to the thumb stud when coming across from the handle, and instead you place your thumb below the thumbstud and flick the blade upwards. Alternatively, with a bit of practice you can flick the knife open using your pointer finger on the opposite side thumbstud. The knife opens smoothly on fairly thick phosphor bronze washers, and rests when the rear of the blade contacts the stop pin. At that point, the Axis lock clicks in to place, and the knife is effectively locked into place until the Axis lock is depressed. Another popular method of opening the knife is to hold down the Axis lock and swing the handle, flicking the blade out and releasing the Axis lock just before the stop pin is reached. That’s certainly part of the attraction of these Benchmade knives: while they make excellent tools, they also make an addictively fun toy to play with. Lockup is absolutely solid, and there is no blade play side to side or back to front. In all honesty, I’ve had issues in this department with Benchmade before. Two Griptilians I’ve owned had blade play on lockup, as well as centering issues. I’ve had a Presidio and a 530 that I couldn’t center for the life of me. While Benchmade is usually happy to deal with those issues, it can be depressing when your knife isn’t perfect out of the box. The Benchmade 940-1 I can happily say was, for all intents and purposes, without flaw when I received it. The blade was dead center perfect, the lockup was solid without compromising the speed and ease of deployment, and there wasn’t a mark or imperfection I could find. The pocket clip that comes with the knife is the Benchmade split arrow pocket clip with a black painted finish. The black finish seemed to come off fairly easily, which is what prompted me to call Benchmade and request a silver deep carry clip. A week later I had the new pocket clip, and in my opinion it is a much better stylistic and functional choice. The original 940 is a closed design with a backspacer, whereas the 940-1 is a flow-through design with two blue anodized aluminum standoffs. Because of the design and material differences, the 940-1 is nearly a full half-ounce lighter than its base counterpart, with the 940-1 weighing in at a feather light 2.44 ounces. Having a knife as slender and lightweight as the 940-1 in your pocket is a true pleasure, mostly because it’s so easy to forget the knife is even there. When it comes to field testing a knife like the 940-1, I try to be as realistic as possible. We are, after all, talking about a knife that weighs under 3 ounces. My testing consists of the day to day activities that I would expect to use a pocket knife for, with a few added tests to make sure the knife won’t fold when I need it most. In the kitchen, the 940-1 excels at processing vegetables and fruit, slicing bread, and basically anything you could use a paring knife for, the 940-1 can do. Processing cardboard is another area where the 940-1 shines, largely because the full ability of the reverse tanto is on display: piercing cuts through the cardboard followed by the slicing cuts needed to process it down. I found that the S90V Benchmade uses could continue cutting cardboard much longer than I could imagine having a need to do so, while maintaining the ability to shave hair from my arm afterwards. My rope test yielded equally impressive results. The blade also does a fantastic job as a letter and package opener, without being overkill, by using the keen tip of the reverse tanto. Now, as I said earlier, I add in a test that goes above and beyond normal use, entirely for my own amusement and peace of mind. I wrap the handle in a towel, secure it in my vice-grips, and whack the back of the blade with a rubber mallet a few times, in a sort of pass/fail test to see if the lock holds up to back pressure. The 940-1 thankfully passed this test as well. So how else could you spend your $260? This is a fairly tough category for me with regards to the 940-1, because the knife world these days is such a vast landscape. Even with all of the options out there, however, there aren’t many knives that give you the reach that the 940-1 can, while still competing in the lightweight category. One knife that I’ve owned, and feel compares relatively well with the 940-1, is the Spyderco Southard. Both knives pack a huge amount of blade into a relatively compact package, have extremely high level fit & finish, and carry very well in the pocket. The 940-1 is the lighter of the two, and in my opinion the more attractive, while the Southard is the beefier and better in terms of blade steel. Probably the most obvious alternative to the 940-1 is its predecessor, the Benchmade 940. Both have the same basic design, blade shape, weight, and deployment method. The 940-1 obviously wins when it comes to blade steel, weight, and handle material, but at nearly $100 more than the base model, it really comes down to how much you value the extras that the 940-1 carries. That’s a decision you’ll have to make for yourself, obviously, because we all value different things moreso than others. Strictly speaking, as a tool first and foremost, the 940 can do pretty much anything the 940-1 can do just as well, while keeping an extra $100 in your pocket. The way I was able to justify spending the extra dough came down to time. I carry my knife every day, I spend time fondling and playing with it, and when I look at my knife I want a sense of pride of ownership, which the 940-1 has in spades over the 940. When you spread that out over a lifetime of ownership, what’s $100 really? I hope you’ve enjoyed reading this review half as much as I’ve enjoyed writing it, and if I was able to help you to decide on owning the Benchmade 940-1, so much the better. It’s true that I’m in love with the 940-1 and congratulate Benchmade on an outstanding feat. I feel almost as if the 940-1 is as much a piece of art as it is a tool, and in the time I’ve owned it, it has been flicked open and fondled, covered in food and once even in tree sap. One of the greatest strengths of this knife is its ability to continue to perform, while looking damn sharp doing so, day in and day out. Simply one of the very best EDC’s your money can buy. I’m sad to say my original 940 may rarely see the light of day, there’s a new sheriff in town.